Art films often take a special type of viewer, one willing analyze and dissect what they are watching. These films can take effort and thoughtfulness to understand, whereas most mainstream films are treated as entertainment that merely needs to be consumed. If someone unfamiliar with art films tried to watch one, they might find themselves confused and frustrated. But in the case of Woodshock, it feels like a film that was made by filmmakers attempting to imitate and art film without understanding the intent behind any choices. In other words, it is a shell of pretentiousness visuals that is completely empty on the inside. Thinking about this film is an act of fruitless futility. This atrociously self-serious wannabe art film is the feature-film debut of sisters Kate and Laura Mulleavy, two trendy clothing designers who attempt to replace talent and experience with ego and inexplicable costume changes. Perhaps there is meaning somewhere buried in this film, but nothing the fashion sisters are trying to say is anywhere near worth enduring their ostentatious film. Most of the movie simply feels like a poor attempt to imitate the success of Tom Ford, with wispy images doing all of the work to carry out a vague narrative. But the visuals aren’t as strong, the characters aren’t developed enough to be interesting, and the narrative bounces back and forth between predictable and nonsensical. The actual storyline centers on a young woman named Theresa (Kirsten Dunst) who is grieving from the loss of her mother while drifting through life as though it were a dream or an extended drug trip. As she also works at a medical marijuana co-op, drugs do play into the narrative, though the psychedelic visuals imply far heavier drugs than the ones shown in the film. Drugs aren’t fun or enjoyable in Woodshock, and the marijuana smoked in this movie is mostly used as a vehicle for a stronger drug that Theresa uses to help put those suffering out of their misery. 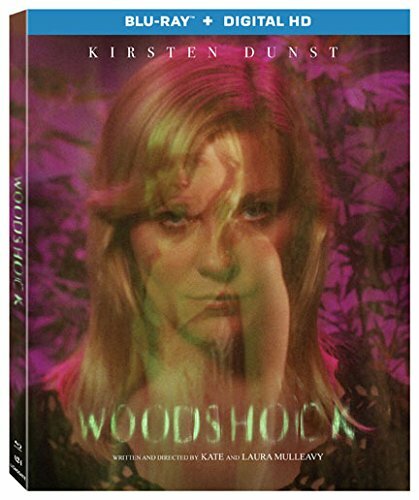 It may sound like something of a spoiler to tell you that Woodshock is ultimately about assisted suicide, but in actuality it has very little to say about the topic. Even though the reveal that Theresa is doing this doesn’t come until later in the film, there are hints early on that she may have had something to do with her mother’s death. When Theresa attempts to provide this service for one of the suffering clients of the co-op, she makes a mistake that might have served as an inciting incident, but it mostly just leads to more scenes of characters looking thoughtfully into the distance without ever saying anything of relevance. This is a film with too many ideas, none of which are fully developed or treated properly. The end result is a collection of scenes that feel disconnected, almost as if made for a demo reel rather than to tell a story. It feels like a film that was made so that the filmmakers could pat themselves on the back for being so artistic, even though there is no substance or significance beyond the prettiness of the visuals and an assortment of lingerie that they have Dunst wear as she wanders through the woods of Northern California. The Mulleavy’s insisted that Dunst lose weight to play the thinly developed role of Theresa, seemingly giving their lead actress the same consideration and character development that they would a model walking down the runway in their clothes. All that matters is the external, making this one of the most superficial art films I have ever seen. There is no intelligence or depth for the art house crowd in Woodshock, but there is also no entertainment or escapism for mainstream audiences, leaving me to believe that this film was merely made to stroke the self importance of the filmmakers who created it. The Blu-ray release comes with a Digital HD copy of the film. Special features on the disc only include a 13-minute making-of featurette, with interviews from cast and crew. If you don’t already think the film is pretentious, listen to the filmmakers talk about it. The high definition presentation of the film may impress some because of the emphasis on superimposed photography rather than an actual narrative, but it is simply a better polish for the turd.